Creative Virtual, a world leader in customer and employee engagement, knowledge management and self-service solutions, is sponsoring an Engage Customer webinar on Tuesday, 27 November 2018 beginning at noon. 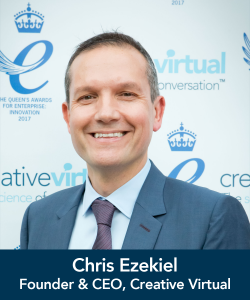 The webinar, ‘Orchestrating a Seamless and Efficient Customer Experience’, is being presented by Chris Ezekiel, Creative Virtual’s Founder & CEO, and Steve Hurst, Editorial Director at Engage Business Media. Register now for ‘Orchestrating a Seamless and Efficient Customer Experience’ through the Engage Customer website. A recording of the webinar will be provided for registrants unable to attend the live event. To learn more about how Creative Virtual’s technology brings together humans and artificial intelligence to enable anywhere, anytime customer and employee engagement, visit the Solutions page.